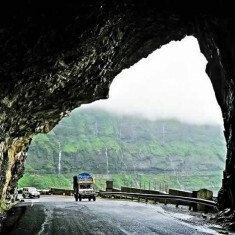 2 road routes from Mumbai to Mahabaleshwar and Panchgani and Pune to Mahabaleshwar are listed below. ROUTE 2 MUMBAI TO MAHABALESHWAR VIA GOA HIGHWAY: The LEAST PREFERABLE road from Mumbai to Mahabaleshwar is the NH 66 (Mumbai – Goa Highway) from Mumbai to Pen to Panvel to Kolad to Mahad to Poladpur to Mahabaleshwar. 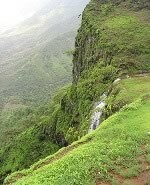 Distance from Mumbai to Mahabaleshwar via Kolad/Mahad is 226 Km (140 miles) [Details Below]. Mumbai to Mahabaleshwar and Panchgani Road Directions, Road Map. Detailed Road Directions from Mumbai to Panchgani and Mahabaleshwar are given below. Please refer to the map. 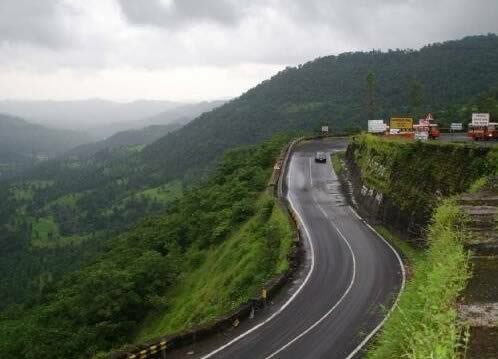 The Mumbai – Pune – Surur – Panchgani – Mahabaleshwar route on the NH4 (also called NH48) is the BEST ROAD ROUTE from Mumbai to Mahabaleshwar and Panchgani, mainly because most of the journey is on two very good national highways (Expressway and NH 4/48). The first part of the journey is on the 6 lane Mumbai – Pune Expressway highway (NH 4) and the second part of the journey is on the 4 lane Pune – Kolhapur – Belgaum – Bangalore-Chennai national highway (NH-4 / NH-48). Even though this route is longer by 40 kms as compared to the Mumbai – Goa highway route (NH 66), this road is FASTER, SMOOTHER and SAFER than the NH 66 (Bombay to Goa highway) route. Total Time Mumbai – Pune – Mahabaleshwar via NH 4 / NH 48: Journey time is between 5:00 to 6:30 hours if journey starts at night (midnight to 4:00 am) and 6:30 to 8:30 hours if journey starts during the day time. For tips on travel, please read the “Recommended Time to Travel from Mumbai to Mahabaleshwar” section. At the BARC flyover, turn left to Yaswant Rao Chavan Marg. Follow this smooth road straight to the Vashi Bridge, past the toll naka, to Vashi Flyover. Almost immediately after the Vashi Flyover there is a left turn to the Palm Beach Road. It is easy to miss this left if you are travelling fast. The straight road can also be taken to reach Belapur and Panvel beyond that, but truck ply on this route and it is not as good as the Palm Beach road. At night, the Palm Beach road has reflectors on the lanes and it is almost like driving on a runway. The end of the Mumbai-Pune Expressway is marked by a sharp right turn and a board sign that say “Mumbai Pune Expressway Ends Here”. The Pune Bypass – Satara – Kolhapur – Belgaum – Bangalore NH4 / NH48 highway starts immediately at this point. NOTE OF CAUTION: The Expressway ends in a very sharp, 90 degrees right turn. Drive slow here and apply brakes well in advance to avoid hitting the wall. As soon as the Mumbai Pune Expressway ends, the Mumbai Pune Bypass Road starts. This highway (NH 4) is part of the Golden Quadrilateral project that connects Pune to Kolhapur, Belgaum, Hubli and Bangalore. Beyond Hubli, this highway is called the NH 48, which is why this National Highway is known as either NH4 or NH48. Drive on this smooth 4 lane highway up to Surur. This highway has 2 separate lanes on each side, so there is no onward coming traffic. For most part the NH4 is a wonderful concrete road. Some sections (especially near Pune) are undergoing extension. MAIN LANDMARKS: Landmarks just before Surur are Wele town, followed by Dwarkadhish Petrol Pump and Park Inn Hotel. The “Surur-Wai” road is on the right. Keeping travelling for 200 metres after the “Wai-Panchgani” road to reach a “U” turn. On taking this “U” turn you will be driving in the direction of Pune (North). Take the left turn to turn West onto the “Surur-Wai” road. There are a couple of toll naka collection points on the way. NOTE: In case you miss the Surur right turn, you can continue to travel for 9-10 km until “Joshi-Wihir” junction. Turn West (right) at this 4 road junction onto the Wai Wathar road. NOTE OF CAUTION: On the smooth NH4, cars tend to drive over 100 km/hr. During the day time there are many motorcycles on this road, which effectively makes it a one lane highway for cars. It is common to see two slow trucks side by side trying to overtake each other and blocking traffic behind them. Trucks also tend to travel in the fast lane (right lane) to avoid the many motorcycles travelling in the left lane. Expect to see many motorcycles near the big towns of Satara and Kolhapur. Please read the “Recommended Time to Travel from Mumbai to Mahabaleshwar” section on tips on when to travel. From Surur on the NH4/NH48, follow the “Surur-Wai” road (until Wai), “Wai-Panchgani” road (until Panchgani) and “Panchgani-Mahabaleshwar” road (until Mahabaleshwar) without any diversions. Mumbai to Goa highway (NH 66) is a two lane highway that passes through Vashi, Panvel, Pen, Nagathone, Kolad, Mahad and Poladpur. At Poladpur take a left to leave the highway and travel West until Mahabaleshwar. The NH 66, was previously known as NH 17, is a two lane highway with one single lane in each direction. For most parts there are no dividers on this road. Overtaking is DIFFICULT and DANGEROUS. This also reduces the speed of the car. In the six years from 2006 to 2011, 1,479 people have died on the NH66 (earlier called NH17). This is the most of any National Highway in Maharashtra. NH 66 passes through many towns rather than bypassing them like NH 4. This increases the journey time. The NH – 66 is the main highway in the Konkan region, and hence it is a busy highway. Since the NH 66 is narrow, any accident leads to blocking of the road and delays. Traffic jams are especially bad during festivals (like Ganesh Chaturthi, Diwali, etc). In short the drive on the Mumbai Goa NH-66 is SLOW, DIFFICULT TIME CONSUMING and DANGEROUS. If possible, avoid this route. From Mumbai to Mahabaleshwar: Start the journey anytime from 1:00 am to 4:00 am in the morning to avoid Mumbai’s traffic. If the journey starts at 1:00 am, one can reach Surur (NH-4) by 5:00 to 6:00 am and Mahabaleshwar by 6:00 am to 7:30 am. At night, the roads of Mumbai till the start of the Expressway are well lit. Both the expressway and Nh-4/NH-17 have less traffic; so the drive is easy and comfortable. If one reaches Surur by 6:00 am, one can avoid most of the motorcycle traffic on the NH4, which is a nuisance. It is advisable to cover the “Ghat” (Hill) section around Panchgani and Mahabaleshwar in broad daylight. NOTE: During public holidays and long weekends, both Panchgani and Mahabaleshwar get very crowded. As the day progresses, there are big lines at the toll naka (on the highway and Mahabaleshwar). To avoid the frustration of having to wait at a toll naka, arrive early. From Pune to Mahabaleshwar: Start the journey anytime between 3:30 am to 4:00 am and you should reach Mahabaleshwar comfortably. From Mahabaleshwar to Mumbai: Start the journey around 6:00 pm so that the “Ghat” section can be covered in daylight. One can reach the outskirts of Mumbai between 11:00 pm to midnight; by which time most of Mumbai’s traffic jam should be over. From Mahabaleshwar to Mumbai: Start the journey around 7:00 pm and reach Pune by 10:00 pm. Image by Karunakar Rayker. Image used under Creative Commons License CC BY 2.0.